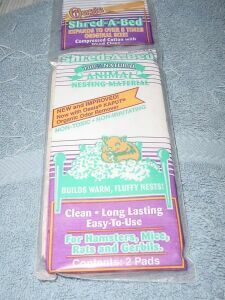 This all natural nesting material is made of compressed cotton fiber, that, once shredded by ratties for their nests, expands to about 5 times its size. It is sold in packages of three 3"x 6" sheets for approximately $2.29. My girl rats have as much fun shredding it as sleeping on it, and I have the comfort of knowing it is non-toxic, and safe for them to have. It is easily cleaned up, and not expensive to replace, while providing your rats with some fun and comfort.